This ultra lightweight, aluminium Equinox DJ Booth Mk2 system comes supplied with a metal shelf, carry bag and heavy duty white and black lycra covers. Additionally you can create a white starcloth effect when combining the white lycra supplied and the optional black starcloth. The latest add-on to this system is the optional overhead kit, this allows the user to create a full light show without the need to have separate lighting stands. Considering purchasing the Equinox Aluminium Lightweight DJ Booth System Mk2? Have questions? Ask people who've recently bought one. Hi Richy, I bought one of these a couple of months ago and it easily fits in my 1210's and mixer. I'm using a Traktor Z2 which might be a little bit narrower than your 850 but I'm pretty sure you'll have no problems getting your kit in. I'm running the decks in standard set-up too so if you're going for a battle set-up you'll have no problems at all! I hope this helps, all the best mate, Dave. Can the original OH lighting frame fit this booth too? Yes, it does. I have a mk1 overhead kit attached to my Mk11 booth, no problem at all. If the aluminium frame is 7.25kg, where is the rest of the 20kg weight coming from? with the Booth the Frame weight: 7.25kg, Shelf weight: 8.85kg and the rest is the scrims bag and packaging. Do you own the Equinox Aluminium Lightweight DJ Booth System Mk2? Why not write a review based on your experience with it. Having watched the video on this, I was incredibly excited to get one. Saved up for a while to afford it and was very excited to get it out. Sadly that ended there. The shelves hooks don't properly fit on the frame. The shelf you have to put on loose and then tighten after you've put it on because otherwise it doesn't fit. And it's heavy! Why so heavy for a lightweight booth? And the bag has developed a hole after the first outing. I've only used it twice! 250 pounds. I expected a whole lot more. So far so good! Sturdy build and easy to setup. Needed a booth for a while and impressed with the portability of this one. Easy to set up and added shelves that fit away nicely is a bonus. Only con I would say is the shelves tend to scratch the booth when put away for transport but this is covered by the cloth. Great product! The booth hides away all cables and the shelf is so sturdy. looks very professional and is so easy to put up. Great carrying case. I previously used a Gorilla DBS Pro aluminium booth with the carpeted wooden shelves and it served me well. The frame was lightweight but the shelves were heavy and the whole thing just didn't pack nicely into the bag, especially if you wanted to leave your LED starcloth fitted. I purchased my Equinox Mk2 booth from DJ Kit in store after seeing exactly how well it was made and how it was set up and packed away. It's actually much quicker to set up and it packs away far more neatly in its bag than the previous model. I've read reviews talking about issues with gaps in panels but mine has no such problems. The two shelf halves do have a small gap in between but I sense it was designed to be that way. I'm also pleased to be able to leave my Quad LED Starcloth fitted and with careful folding of the booth when packing away, there's almost no risk to the LEDs as the shelves are safely tucked inside. It's actually a very nice design and the bag is more rugged too. My only gripe is the weight - it's quite heavy. The frame may be lightweight but the shelves are seriously heavy (I think they are steel), so overall it does seem heavier than the Mk1 but the ventilation provided by the mesh shelves and the neat storage and folding system makes it an overall winner for me. The booth is impressively sturdy, very good buy. Bought to replace my slightly battered MK1 - mainly as it was working out cheaper than replacing shelves, white lyrca and bag! Wish I hadn't bothered. Firstly, the shelves didn't fit together and a replacement was sent via Prolight (Thanks to Greg at djkit). When it arrived, the shelf doesn't actually fit square so it cannot be tightened until it's in place and even then there being a gap between the two panels. Compared to the MK1 the MK2 is an awful 'upgrade'. The MK1 has nice hinging and small gaps in the frame - the MK2 has large hinges and huge gaps in the frame. Due to these larger gaps, the overhead system (another £199 on top of the booth itself from the MK1) doesn't fit so a new overhead system would require purchasing! Safe to say the MK2 will be making a return to DJ Kit. For £250, this booth is cheap and nasty compared to the MK1, which was the same price three years ago. I use this when a larger booth is required and its so much easier to setup than a faÃ§ade which takes two people. This is easily done in minutes on your own. I was a bit sceptical at the video but its true - it is really that easy. Black or white scrims are solid and tie down nicely. With the star-cloth addition either on its own or under the white its even better or you can light it from the base. Very sturdy lightweight construction just take note of the folded size - its not small. Also resistant to drunk people trying to topple it too. Having used both versions, the difference in weight is reason enough to upgrade. Top Quality, and up in less then 3 mins. Really happy with the product. Small rip in one of the cloths bags but got sorted straight away. Love this booth, very light. Set up and pack away in minutes! Brilliant design. Easy to erect and pack away. Not light to carry. Great, sturdy bit of kit. Makes my setting up and taking down a lot quicker! The product came securely packed in not one but two cardboard boxes which was reassuring. On pulling the carrying bag out of those boxes I was surprised at how heavy this new "lightweight"booth was - but you have to bear in mind that it was replacing a Gorilla stands "limelight" folding screen as my "frontage", which although of similar size, has less metal framework. At first glance the bag itself was extremely sturdy with well placed reinforced carrying handles/straps.On removing the screen I could see that both the lycras supplied came in their own individual zipped up bags that are of the same quality as the main bag. As for the frame, when you remove the grille shelves it becomes a reasonable weight - I guess that the shelves and shelve square tubing are in steel rather than the aluminium tubing the the booth itself is constructed from. After a few minutes thought, I removed completely the heavy screw in feet and the shelf finger screws from the booth - this relieved the weight by a substantial amount and is worth doing as it does not compromise the units function in any way. The joining and mounting of the shelf in the frame can be either a/ easy or b/ a bit of a faff depending on how you do it. slide together the shelf halves and with the booth in the "open" position but not fully open, slide one side onto the booth's side tube but do not locate it, then slide the other side on and then slowly push the sides apart until the tabs on the shelf drops onto the bar and locates. It works for me but your mileage might vary :) The black scrim was easy to drape over the frame but on a subsequent wedding gig, the white one's stitching broke at the lower corner and I just had about enough "scoop" to keep it attached to the lower corner of the booth side. The white scrim looks great with a couple of LED par cans lighting it up although I plan to purchase the LED starcloth at a later date. Overall a great addition to your setup, it hides the wires and looks professional but I'm sure a lighter aluminium shelf would have had me giving it five stars. The scrim stitching quality could be improved upon as well, although mine might have been a rogue item. Yes itâ€™s great, dose what I need it to do, protect my gear as I was using a table and itâ€™s not that good when ur busy and set up right on the floor, table only good when on a stage or out the way, thatâ€™s why I went for this to help protect my gear. The only down side is my set up is for a table height weâ€™re when I use the booth I need to stand on my case lids as my flight case is high, not everybody has the same setup so a extra bar for lowering the table on the booth would be good. So stand on my lids or replace my flight case. But in all dose the job, just need to decide on whether to buy the over head rack. This was a great addition to my set up, it now looks more professional. Adding a couple of par cans behind the white lycra produces a great look. If you want to set up your booth in under 90 seconds and have a professional look to your set, buy this and never look back!!! Portable and set at the correct height, no more backache using a table. Whilst the basic frame is the same design, this revised version is considerably lighter in weight and has an intelligent storage system for the shelf. The shelf comes in two parts which slide together and tighten using large butterfly style bolts. This version also has small circular feet which can be adjusted to cope with uneven floor levels. Set up is marginally quicker than the previous version but this updated booth is so much lighter to handle and move around. Supplied with the booth are two cloth covers, one black and one white and both with a good quality storage bag each. These are of better quality than the original version cloths, being slightly thicker and not creasing so easily when packed away. The carry bag is also much more robust with foam padding and made from from a better material. Bags were always a let down with the original booth - this has been addressed with the revised version. The overhead kit for the original version also fits this new booth as does the RGB starcloth, so if you have the old version everything will transfer across and fit the lighter version just fine. To top it all off this new version is also at a considerably lower price point than the original. What's not to like!! Presentable, professional, well worth purchasing. Recommended - gets 5 stars. 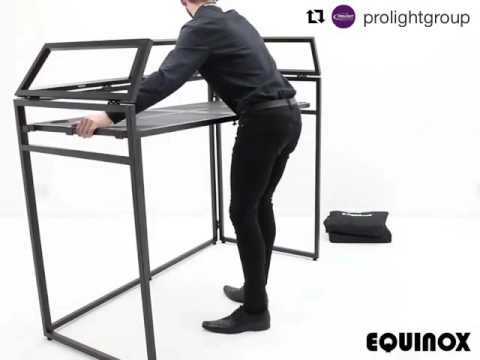 Seen a video for Equinox Aluminium Lightweight DJ Booth System Mk2 online or have you own video? Check out Equinox Aluminium Lightweight DJ Booth System Mk2 on DJkit.com!